FACEWEALTH ANTI-ACNE SOAP has antiseptic, antibacterial, antifungal and antiviral properties hence it prevents and cures acne. 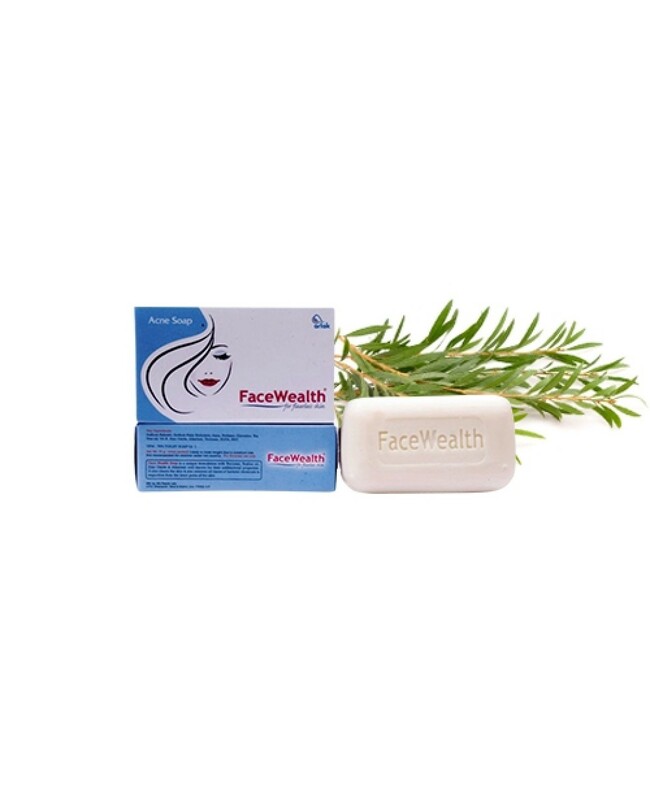 FACEWEALTH ANTI-ACNE SOAP helps in diminishing the bacteria that lead to body odor. FACEWEALTH ANTI-ACNE SOAP helps control blemishes without being overly drying for the skin. FACEWEALTH ANTI-ACNE SOAP helps heal cuts and bruises and is also effective against more serious infections. FACEWEALTH ANTI-ACNE SOAP has powerful antioxidant effects. FACEWEALTH ANTI-ACNE SOAP fights harmful rays to penetrate into the skin and cause wrinkles. FACEWEALTH ANTI-ACNE SOAP lowers skin inflammation. FACEWEALTH ANTI-ACNE SOAP also treats pigmentary disorders. FACEWEALTH ANTI-ACNE SOAP improves synthesis of collagen and new connective tissue. FACEWEALTH ANTI-ACNE SOAP reduces the tenderness associated with sunburns and soften chapped skin. FACEWEALTH ANTI-ACNE SOAP reduces the number and severity of acne breakouts. Oil from the tea tree, known by the botanical name Melaleuca alternifolia, has antiseptic, antibacterial, antifungal and antiviral properties. The tree grows wild in Australia, and is now cultivated extensively as a consumer product ingredient. Tea tree oil imparts a crisp, clean scent and soothes the skin with its natural healing properties. Tea tree oil soap can help beat body odor. Antibacterial soaps can help resolve body odor, as can tea tree oil soap, which is antimicrobial. Bathing regularly with tea tree oil soap can diminish the bacteria that lead to body odor. The tea tree oil in soap also has a fresh, invigorating, clean scent, according to The Body Shop, a leading purveyor of natural body care products. Liquid tea tree oil soap can also be used as a shampoo as well as for adding a fresh scent to laundry. Tea tree oil soap can clear up acne, helping to create naturally glowing smooth skin. Tea tree oil helps control blemishes without being overly drying for the skin, As a natural antiseptic, tea tree oil soap helps heal acne and other skin ailments. Tea tree oil reduces bacteria and inflammation, improving the appearance of mild to moderate acne with fewer side effects—such as stinging, burning and dryness—than those caused by commercial benzoyl peroxide acne preparations. Tea tree oil is a natural antiseptic that helps heal cuts and bruises and is also effective against more serious infections. According to the Public Health Guidelines for Clinical Management and Control of Transmission of Community-Associated Methicillin-Resistant Staphylococcus Aureus, or CA-MRSA, daily bathing or showering with tea tree oil body products and shampoo is an effective method of decolonizing a person carrying CA-MRSA. The Wisconsin Division of Public Health further notes that treatment with tea tree oil products has the benefit of being less harsh on patients' skin than chemically based antibacterial agents. The main benefit of vitamin E often united with glycerin soap is its powerful antioxidant effects. Antioxidants fight free radicals from pollutants and toxins in the environment and foods. Free radicals cause cell damage and diseases like cancer. The world is full of damaging free radicals, and sunlight is just one of them. In addition to premature wrinkling caused by sun exposure, free radicals in pollution can reduce the skin’s natural levels of vitamin E, making it more susceptible to wrinkles. Smokers are bombarded by these damaging substances from both inside and out -- cigarettes cause the body to produce free radicals and the smoke itself is packed with them. Moisturize with a face wash containing vitamin E, and you can harness its anti-oxidant properties to help protect against each of these types of potentially aging free radicals. It’s also thought that face wash containing the alpha-Tocopherol form of vitamin E may reduce the depth of existing wrinkles and shorten facial lines. Limit razor burn and irritation by using a shaving cream containing vitamin E. When you’re removing hair from sensitive skin areas, like the underarms or the bikini line, there’s an increased chance of sore, post-shaving redness. Soothe the rash and can act as an anti-inflammatory. Men who suffer from razor burn can get the same relief from a vitamin E to calm the skin and reduce redness on the chin and neck. Providing broad-spectrum sun protection that prevents burns (including on photo-sensitive skin). Helping to lower skin inflammation associated with rashes, allergies or irritation. It also helps to treat the Acne Breakouts. It locks the moisturizer into the dry skin. Lowering inflammatory dermatoses (including rosacea). Preventing aging of the skin. Improving synthesis of collagen and forming of new connective tissue. Zinc oxide is also effective for healing the skin. It can be used to heal wounds, reduce the tenderness associated with sunburns and soften chapped skin. People who are zinc deficient typically experience slower wound-healing times. When zinc oxide is applied to the wound area, it provides the body with the extra zinc it needs to repair skin cells. Zinc oxide helps keep the wound area moist and clean. Allantoin is a unique product that is used for skin protection. Allantoin is a white, odorless, crystalline powder. Allantoin is also used to hasten the growth of new, healthy tissue. Allantoin increases the desirability of cosmetic creams and lotions by its action as a skin protection. Allantoin has been used in various cosmetics like shampoos, lipsticks, shaving creams, suntan products, bath foams, hair gels, baby powders, as well as the typical lotions and creams. Helps prevent and temporarily protects chafed, chapped, cracked, or windburned skin and lips. Relieves dryness and softens cold sores and fever blisters. It is postulated that Allantoin cleanses away necrotic tissue, speeding up the growth of new, healthy tissue. Since Allantoin stimulates new and healthy tissue growth, healing epithelization may take place. Allantoin also has been described as a cell proliferant, and epithelization stimulant and a chemical debrider in texts such as the United States Dispensatory, Merck Index, and British Pharmaceutical Codex. Allantoin is an amphoteric compound that is anionic under basic conditions. Allantoin is compatible with most ingredients used in personal care formulations. This medication is used as a moisturizer to treat or prevent dry, rough, scaly, itchy skin and minor skin irritations. Triclosan is an anti-bacterial agent that can be found in a number of household items such as first aid creams, mouthwash, deodorants, and toothpaste. Triclosan is also a common ingredient in hand soaps and cleansers that are designed to clear up acne. Triclosan works in a manner that it similar to that of some treatments for acne by killing harmful bacteria on the skin. Triclosan is generally considered to be an effective anti-bacterial product though there are some concerns about its potential risks to health. The major benefit of triclosan is its ability to remain on the skin for prolonged periods of time. Triclosan is not very water-soluble and has a slow degradation time that allows it to remain on the skin and continue to destroy bacteria after washing. Because this anti-bacterial is believed to be effective against 99.6% of germs, triclosan's properties are useful for people who apply it to areas of the face and body that are affected by acne. Triclosan acts as a protective agent that encourages the longevity and effectiveness of other treatments for acne. When used solely to combat skin disorders, triclosan is not as strong as some other solutions that are designed for the same purpose. Used for cleansing and creating later. This chemical acts as a surfactant and emulsifying agent and is a key ingredient in soap. So if you are looking to buy anti acne soap online at cheap rates then visit Healthbuffet once. SODIUM PALMATE, SODIUM PALM KERNALATE, AQUA, PERFUME, GLYCERINE, TEA-TREE OIL, VITAMIN-E, ZINC OXIDE, ALLANTION, TRICLOSAN, EDTA, BHT.